Le Cache Euro 3800 Wine Cabinet Provincial Cherry (P/N 751). Designed by acclaimed, Pinnacle Award-winning designer Martin de Blois, our European Country Series wine cabinets evoke the timeless elegance of European furnishings. Architectural details such as crown and base molding, paneled sides, hardwood French doors and hand-carved accents showcase fine wine collections with a sense of luxury and style. Sealed seams, premium insulation and tinted double-paned glass provide thermal and UV protection.These options are included in the price of your wine cabinet. NOW EVEN QUIETER! The Euro 3800 is designed for passionate wine connoisseurs with sizeable wine collections, featuring hand-carved accents and storage capacity for 458 bottles. I first ordered a 1400 series back in 2009. This cabinet worked perfectly, looked fantastic and the customer service was 100%. After several years our collection of wine grew and I needed to expand. In 2014 I ordered the 3800 series to place in a different room in the house. Again, a great cabinet that fit the need! After a year my cooler went out so I called customer service. They shipped out a new cooler, talked me though the installation and provided a return label for the old cooler. This is how customer service should work. If you are thinking about a Le Cache wine cabinet you can stop.... just order it you will not be disappointed in any way! 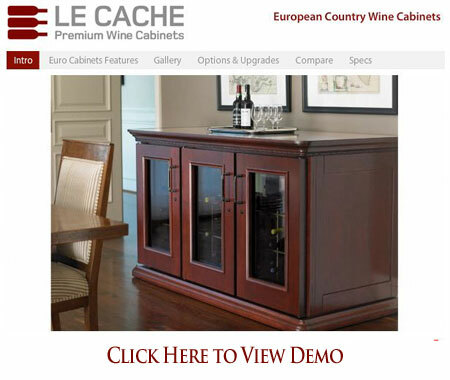 I spent six months researching wine cabinets before I ordered the Le Cache Euro 3800. I'm delighted by the style and quality of the cabinetry. It is absolutely beautiful. I'm also very pleased by the CellarPro cooling systems' temperature and humidity control performance. My patience paid off and I made the right choice! I LOVE my wine cabinet. It arrived in perfect condition, the delivery team was excellent, and it's more gorgeous than I imagined. Thank you!